Smart contracts on the Ethereum main-net use real money, so building error-free smart contracts is crucial and requires special tools like debuggers. Remix IDE is the most fully-featured IDE for Solidity. Among other tools, it has an excellent step-by-step debugger. You can perform various tasks such as moving in time, changing the current step, exploring local variables and current state by expanding various panels. You can also set breakpoints to move between different points in the code. And the terminal allows you to display transactions executed from Remix and debug them. Throughout this tutorial, we’ll use Truffle and OpenZeppelin to build a simple custom token. We’ll see why and how to flatten the contract, and finally we’ll use Remix IDE to start debugging the contract. Why Flatten a Smart Contract? Flattening a smart contract refers to combining all Solidity code in one file instead of multiple source files such that, instead of having imports, the imported code is embedded in the same file. We need to flatten smart contracts for various reasons, such as manually reviewing the contract, verifying the contract on Etherscan, or debugging the contract with Remix IDE, as it currently doesn’t support imports. Remix IDE is officially recommended for building small contracts or for the sake of learning Solidity, but once you need to build a larger contract or need advanced compilation options, you’ll have to use the Solidity compiler or other tools/frameworks such as Truffle. Besides error-free contracts, security is also a crucial part of building a smart contract. For this reason, using battle-tested frameworks like OpenZeppelin that provides reusable, well-tested, community-reviewed smart contracts, will help you reduce the vulnerabilities in your Dapps. Let’s now see how we can use Truffle and OpenZeppelin to create a simple custom Token that extends the standard token from OpenZeppelin. This tutorial requires some knowledge of Truffle, Ethereum and Solidity. You can read the Blockchain Introduction and Ethereum Introduction. You also need to have Node.js 5.0+ and npm installed on your system. Refer to their download page for instructions. This command will create multiple folders, such as contracts/ and migrations/, and files that will be used when deploying the contract to the blockchain. This is the contract that we’re going to flatten and debug. We’re importing the OpenZeppelin StandardToken.sol contract and declaring our SimpleToken contract which extends StandardToken.sol using the is operator. Our contract will inherit a bunch of variables and functions, which need to be overridden in order to customize the contract. Using this file, we can deploy/migrate our smart contract into the blockchain, but we don’t actually need this for this example, because we’re going to use Remix IDE to deploy the smart contract after flattening it. Truffle Flattener is an npm utility that flattens or combines Solidity files developed under Truffle with all of their dependencies in the right order. truffle-flattener outputs the flattened contract into the standard output or the terminal. Using the > operator we save the output in the FlattenedSimpleToken.sol file inside the current folder. You can access your flattened smart contract from the FlattenedSimpleToken.sol file. Open the file and copy its content. Next, open Remix IDE from https://remix.ethereum.org and paste the flattened smart contract into a new file in the IDE. If you get an error saying Mock compiler : Source not found, make sure to select a newer compiler version from Settings tab > Solidity version pane > select new compiler version dropdown. If Auto compile is disabled, click on the Start to compile button in the Compile panel. To see how we can debug the contract, we’ll first introduce some errors. You can start debugging smart contracts in Remix IDE using two different ways, depending on the use case. When you first deploy your smart contract or perform any transaction afterwards, some information will be logged in the terminal and you can start debugging it from the white Debug button next to the log. Let’s see that in action. VM error: invalid opcode. 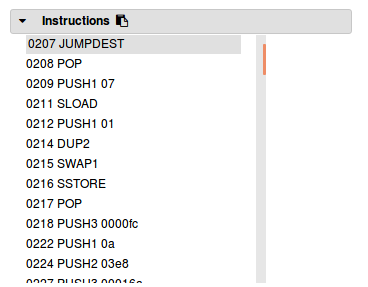 invalid opcode The execution might have thrown. Debug the transaction to get more information. Once you click the Debug button you’ll be taken to the Debugger panel where you can start debugging your code. In the code editor, the first line/instruction will be highlighted marking where we are currently at the code. Click on the Step over forward button to step through the code. You can also jump right in the exception using the Jump to exception button. Whatever way you’re using, the debugger will take you to the code causing the problem, and will then stop. You can inspect the state of the local variables at the current step. The Solidity Locals panel displays local variables associated with the current context. From the source code and Solidity Locals, you can conclude that the source of the problem is related to the assert() method and the value of b being greater than the value of a. You can stop debugging using the stop debugging button. It’s also worth looking at the other panels of the debugger. The Instructions panel displays the byte-code of the debugged contract. The byte-code of the current step is highlighted. 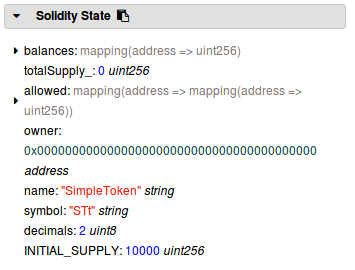 The Solidity State panel displays state variables of the currently debugged contract. 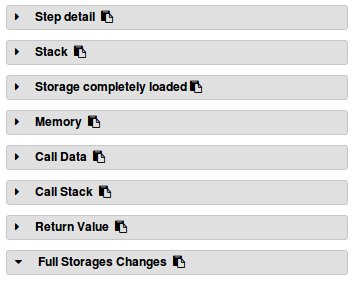 These panels display low level information about the execution such as step details, memory, stack and return value of functions. In this tutorial, we’ve used Truffle and OpenZeppelin to build a simple token, then used truffle-flattener to flatten the custom contract and Remix IDE to start debugging the contract for errors. Hopefully this will help you fearlessly dive into step-by-step debugging of your own contracts. Let us know how it works out for you! Ahmed is a web entrepreneur, developer, digital marketer and blogger. He writes about software and website development, money-making tips, SEO and more. You can find more of his writing on his Techiediaries site.